US Bankruptcy Judge Steven Rhodes made a ruling on the city of Detroit's bankruptcy that is causing shock waves around the nation. Judge Rhodes basically stated that Detroit's pension debt is no different from any other debt Detroit has. This means that, in effect, those municipal workers in Detroit are between a rock and a hard place in regard to their pensions. They will see less in their pension payments, some remarkably less, once they have retired. What is so tragic is that this is coming late in the working careers of these municipal employees. They will have little recourse in trying to counteract this cut to their pension plans. Some are viciously criticizing Judge Rhodes over his decision last week. However, some blame must also go to the unions who were so intransigent in negotiations on union pay and benefits. My feeling is that there should have been some give and take with union negotiations. That is too late now, unfortunately. Was there wasteful spending and mismangement in Detroit city government? It would certainly seem that way. Detroit has been hanging by a thread for many years, teetering on bankruptcy every single year for at least a decade. When I worked for the federal government we had a contributions based pension where the employee owned their own pension fund, not the government. However, as I remember, the unions fought that tooth and nail initially. As it turns out, it was beneficial for both employee and management. I have great sympathy for the Detroit workers nearing retirement. 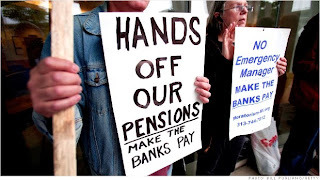 They will have to either make do with less than promised with their pension or find alternative ways to make up for this cut in their pension. It's easy to say they can buy CDs at the bank or establish a 401k fund now. But, how does a low paying city employee do that if they are age 50+? Some, if not most, just now get by on their weekly salary. Do you pay your bills now or try to save for an additional retirement fund? For most, trying to put additional funds into an alternative retirement plan is not going to be an option. However, these city employees should have seen the handwriting on the wall a long time ago. The city of Detroit could not sustain that kind of debt forever. They should have been preparing for this day when the reality became clear that their retirement pension was in danger. EDITOR'S NOTE: I am accepting guest posts on my new blog, "The Retirement Life." You must be in the financial field with an emphasis on retirement. I seek someone who can give sound financial advice for future retirees, people already retired. I will consider other financial advice in the future. Right now, I want to focus on retirement financial advice. I offer an exchange of links as compensation. If you are interested. please use the "Contact Us" link on the right column. Please put "Guest Posting TRL" in the subject line. Provide any links to your work on the web. Thanks.